Every Festival could not go on without the hundreds of dedicated people who volunteer their time to support this wonderful fall weekend! If you're interested in joining one of the many teams that cover everything from store runs to helping guests, setting up tents and more, contact us right away. Student Volunteers: We accept students 12 and older for work hours, and are happy to complete any paperwork or send necessary letters to confirm contributed hours. Volunteers receive FREE entrance into the festival and food tickets based on shift length. Shifts are an average of 2-4 hours depending on the job, but you must work at least 4 hours to qualify for compensation. At 7pm, inside the 4H Training Center Building of the Niagara County Fairgrounds. Thanks for your interest in helping us pull off one of the biggest festivals in Niagara County. We look forward to meeting you! 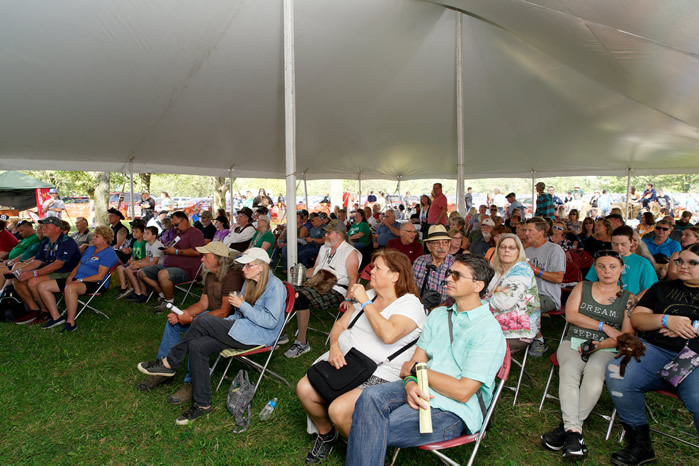 The Volunteer Team Leaders will receive your information and will contact you as the festival nears and positions are filled (you may not hear back until August when scheduling begins). Please email volunteers@niagaraceltic.com with any questions you have. It's proven that loyal event fans are loyal to their sponsors. Niagara Celtic is one of the best upscale heritage destinations in upstate NY, hosting some of the best artists, performers, artisans and vendors from around the world. Our goal is to remain one of the most independent and authentic Celtic events in the region. You can help us achieve this goal by becoming a sponsor. Together we'll make our 19th year the best yet! Let Niagara Celtic help you advertise to WNY & beyond!! The guidebook is FREE to attendees when they enter the grounds. We expect at least 13,000 visitors traveling to Eastern Niagara County from across Upstate New York, Pennsylvania, Ohio and Ontario. We're always looking for those willing to share their education, experience and/or skills with our guests. Classes are 30-60 minutes depending on the subject, and hands-on activities are highly wanted. For details and questions please email Gretchen S. at gretchen@niagaraceltic.com. Limited spaces available. All visiting clans will receive a 10x10 grounds space and complementary passes for workers. Need tent, chairs, tables and/or electric? Call us for prices. We'll also make a donation to your clan for attending, to help with traveling costs (more for attending the entire weekend). You may bring whatever you'd like for display: costumes, albums, scrapbooks, maps, charts, photos and more. Bring membership forms and souvenirs for donations to your group. Need more space for larger displays? Just let us know ahead of time so we can reserve a larger space. Email Tim & Chris N. at clans@niagaraceltic.com with questions. Niagara Celtic is filled with organizations, displays and other items unique to Celtic history and heritage. We are looking for historical and local organizations that are willing to participate in our festival. Your group does not have to be Celtic to participate. Contact Liz A. (email) for information, and to see if your organization fits our festival. Do you have a skill that has some form of Celtic background? Please call us, we would love to have you participate in our festival (you may receive compensation for your travel and time). Demos we are looking for include: animal attractions & exhibits, historical reenactments, swordsmen & more. Call Beth B. (716) 778-5730 or email: beth@niagaraceltic.com. One of the more valued sights on the grounds are those who are dressed up to show another period of time and history in Celtic heritage. If you participate in a re-enactment group, please email Phil D.: phild@niagaraceltic.com. This includes: Pipe Bands, Dancers, Dance Schools, Bands, Solo Artists. Please mail us any information (demos, and/ or cds) you have about your group to help us make our decision. Our ability to listen to demos will improve your chances of being invited. Email: beth@niagaraceltic.com or call 716.778.5730. We accept all athletes from around the globe, including those who have never participated before. Contact Paul to get details about events, training, practice events, or to simply watch the many games held in the US and Canada throughout the year. Please Note: For those who haven't participated in games before, it is required you have some training before entering any major events, including the games during the Niagara Celtic Heritage Festival. Please contact Paul for details on training and practice events. Call Paul K. - 716.433.6727 (please leave a message and remember it may take time as he's very busy). We are honored to receive positive reviews & excellent comments from our attending vendors. We work hard to see that our vendor's needs are met, whether it's having full water and electricity supplies or being located near the shade, etc. Contact us today for complete details on a festival guaranteed to leave your pockets full and your faces smiling! New Vendors: Interested in joining our growing family? Please email us to have your questions answered about our prices, the festival itself and the area. **You must sell at least some products with a Celtic connection. NOTICE: When emailing*: tell us your name, address & phone, along with what you plan to sell. *Contact us ONE WAY ONLY, by email preferably. It helps if we're not receiving emails, phone calls, Facebook messages, texts, etc., all within a few hours or days (which do not help your chances of being accepted; remember we are volunteers!). If we are interested, we'll contact you and mail out a contract. Please be patient if you don't hear from us immediately...we will get in touch with you as soon as we can. PLEASE NOTE: Due to high volumes of requests, limited space availability and busy volunteer schedules, it will take time to receive a response! 2019 Press Materials & Info. Note: All press releases/ photos/ logos are copyright protected. Use of them in a way considered unsatisfactory to the society, or use of them in an inappropriate manner, will result in swift and serious legal action. Niagara Celtic was honored to have been chosen by Constant Contact to be in one of their 2012 promotional videos!